I know it’s winter, but I still love my summer squash. Especially the zucchini. I eat it raw, roasted, steamed, pureed in a smoothie or dip, or…spiralized into a noodle. What kind of smack talk is that? 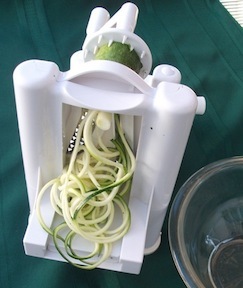 With the easy assistance of my second-favourite kitchen tool, the spiralizer (you know my Vitamix wins any kitchen tool contest), I comfortably nip off the ends of a zucchini, insert it onto the machine, and crank the handle. Et voila. Wonderful, long noodles! So, last night, I made a very simple and yummy dish of creamy zucchini noodles. 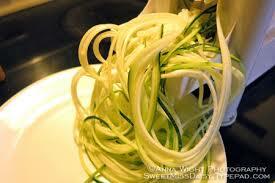 I spiralized one large zucchini and placed the noodles into a medium bowl. I scooped out the innards of half of a large avocado and gently massaged this creamy goo into the noodles, using my hands. I chopped up several grape tomatoes, minced 1/4 of a small red onion, crushed a tiny garlic clove and added all of this to the avocado’ed zucchini noodles. I added sea salt and pepper to taste, and a couple of tablespoons of nutritional yeast (you can add parmesan instead). 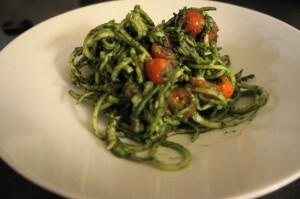 Being wild about my sea vegetables, I added a sprinkle of spirulina, but you can certainly do without this. I gave the whole dish some good tossing, and wow…this was so, so tasty! What do we need to know about the nutrient value of the zucchini? Well, it is full of our friendly antioxidants, especially carotenoids, vitamin C, and manganese. Carotenoids provide superb eye protection, particularly against macular degeneration and cataracts. Like any good vegetable, the zucchini provides us with ample fiber, especially pectin. B-vitamins abound, and alongside the fiber, help to regulate our blood sugar levels. 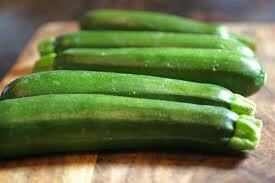 Don’t peel the zucchini – you’ll find most of the nutrients in the skin. So if you can, buy organic zucchini to avoid the pesticide residue. Store zucchini in the fridge for up to 7 days. Stay warm, friends back east!